Rachael Denhollander was sexually assaulted by Larry Nassar 16 years ago, when she was 15 years old. Today, she was named one of Time Magazine’s 100 Most Influential People for 2018. Editor’s note: Rachael Denhollander, the first woman to publicly accuse Dr. Larry Nassar of sexual assault, first posted these remarks Wednesday on Facebook. She was responding to an email Michigan State University special counsel Carol Viventi sent to MSU trustees calling another Nassar victim’s account of a meeting with Interim President John Engler (in which she said Engler offered $250,000 to settle her claims) “fake news”. Viventi had portrayed the meeting as an effort to “set up” Engler to get a larger lawsuit payout. On Wednesday, Viventi apologized, saying she didn’t mean to cause more pain for women Nassar assaulted. Denhollander gave Bridge permission to republish her remarks. This is disgusting. No, this is not an apology. The problem isn't that we "felt bad" Ms. Viventi. The problem is that you LIED to the MSU Board. 1. Kaylee and her mom were never trying to keep the meeting "confidential". In fact, they had talked many times with me and other survivors about their desire to meet with President Engler to discuss the cultural problems at MSU. It was a desire many of us shared, and had expressed or requested directly to President Engler. 2. They weren't afraid of being "in trouble,” which is why they came to me very soon after the meeting to ask if I had ever met with Engler and discussed a settlement. 3. "Amounts" WERE discussed in that meeting, even Emily Guerrant acknowledged a "philosophical discussion" about how much would be acceptable in a settlement. You may wish, in the future, to get your stories to at least align if you wish to continue such a ruse. 4. No, Engler was NOT trying to "follow the suggestions of those who wanted him to meet with survivors". In fact, those emails you referenced by Lt. Gov Calley - it was a request to meet with me. Engler never answered him. He then told other Senate leaders who requested this, (and) that he couldn't meet with me due to "litigation". If he had wanted to honor requests to meet with survivors, he could have, and would have, done so, instead of refusing to do so. 5. We, the survivors, are not "injuring the university.” YOU, by enabling the culture of sexual abuse, attacking survivors, and making the same character accusations as our abuser's defense attorneys (that we are lying to get money) damages MSU. 6. President Engler has, in fact, lied multiple times publicly about survivors, our motivations, the legislative package, and the state of affairs at MSU, including to the Senate Higher Ed committee. If you replay the video of that committee meeting, you will see some of those "facts" refuted by our state senators. I'm quite happy to refute the others. 7. Both President Engler and Bob Young have clear track records of handling sexual assault abhorrently in their professional capacities as governor (the jail situation is a notable example) and in judicial opinion. And yes, when you and Rob Young tell people that Kaylee and her mother are making “false and inaccurate statements” (lying) to “set up” MSU to “increase the cost of settlement”, you are, in fact, revictimizing. You are, in fact, part of the problem. The worst part is, I think it’s very possible you, President Engler, and Bob Young truly believe that MSU is the victim here. Truly believe we are in this for the money. Truly believe we are making things up. Because your perspective is so warped and skewed that you can’t even recognize the deeply (e)mbedded cultural problems at MSU, you can’t acknowledge what an enabling culture looks like, and you really think money is what motivates sexual assault survivors to come forward. And that is why you are unable to help fix the problem, and only compound it. Because you can’t even SEE the problem. And that is why all three of you, and every Board member who keeps supporting you and doesn’t force resignation, needs to go. As an employee of MSU I can tell you that this whole sordid mess is taking an emotional toll on the health and well being of some employees, one person I know who has no connection with the athletic dept. is so upset they are retiring early just to get away from the school. As soon as I heard Engler was appointed to this position and then seeing the way he handled the "students" concerned with his appointment, I knew this was toxic. This is a reflection of the incompetence of the board and have long term consequences to MSU. Ms. Denhollander is shining the light on these issues at MSU and demonstrate the depth and breadth of corruption in the administration, Engler and anyone else involved in this deception. It is shameful the way this is being handled. How long will MSU allow this to go on? John Engler has always been a man motivated by greed and a thirst for power. I was shocked when he was selected as interim president of the university. His track record regarding women's rights, sexual assault of women, corruption, and workers rights left little doubt in my mind that he would only make matters worse for the victims. He has lived up to my low expectations and low opinion of him. My views are generally too conservative for this publication, but this time I have to say I wholeheartedly agree with Ms. Denhollander. John Engler has one goal and only one goal--the furthering of John Engler. Engaging Robert Young, former insurance attorney-turned-Engler appointee-turned-high-dollar-shill, clearly demonstrates Engler insensitivity toward Nasser victims. One may disagree with me as a conservative on a philosophical basis, but don't ever confuse my conservatism with Engler's self-interested Stalinism masked as same. Well stated, Rachel! I'm with you 100%. We need a clean sweep at MSU. The Board and Mr. Engler are out of touch. MSU is a public institution and the public needs assurances that our priorities are being met. Allowing victimization to occur and then re-victimizing the innocent are not actions aligned with public values. The public cannot tolerate this behavior, nor should we. Will state lawmakers please act to remove these weasels? The decision to hire Engler was a reaffirmation -- as if one was needed -- of the MSU Board member's incompetence and inability understand the necessity of owning responsibility at an institutional level in clear and unambiguous language, and acknowledging the type of personal responsibility that comes with being an institutional leader. It boggles the mind to realize that board members have not yet seen the light. Engler has clearly become a part of the problem. He should have the grace to resign (unlikely), so the board needs to do the right thing and dismiss him. The healing process, both for victims and for those associated with the university as employees, alumni, or students, cannot begin until the university's "leaders" either show some true eadership or else get out of the way. Engler, Young, and all of the MSU trustees must be replaced if MSU is to fix its problems. Attacking women who for years have tried to tell MSU what was happening is appalling, and Rachel is correct in her assessment. I have written to trustees with no response, initially with concerns about Engler because of his history. He has surrounded himself with syncophants, and the MSU board of trustees is complicit. Time for a shake up. They are all part of the culture. This nightmare only got worse when the Board decided to appoint Engler. They seemed to think he could use his legendary influence with the legislature, which was characterized by arm twisting and horse trading and threats, to lessen the blow to MSU. The victims and the culture of abuse and secrecy were not primary considerations in Englers selection. The Board needs to get this right soon, or the university will suffer even greater humiliation. I am sympathetic with the comments of Ms Denhollander, but they were written as a response to a particular statement, and they allude to events with which I am not familiar. For example, the questions or comments of state senators in a hearing with John Engler. I would appreciate reading a mmore complete narrative account, either from her or from the Bridge staff, including her accusations (and any rebuttals), that would take less prior knowledge by the reader for granted. You are literally making your ignorance a problem that Denholder et al. should fix. Google is right there in another browser tab educate yourself. Your post is what is wrong with or politics today, ignorant people acting like intellectual baby birds instead of hunting-gathering their own information. Could you be more specific? It appears you are trying to baselessly defame Ms. Denhollander, but trying to appear something else, like just an 'interested observer'. Could you tell us and describe a 'mmore complete narrative account' that would satisfy you? Engler is and always been disgusting on the subject of sexual assault. MSU hired John as a fixer to make the problem go away instead of dealing with it in an open manner to help the college heal itself. This whole MSU problem isn't going away until Engler is replaced and the board is churned to rid itself of Engler look and act a likes. The question is when will MSU's President take action to fix this festering never ending boil of discontent that bleed over into all facets of MSU lives. There’s no mystery behind the MSU Board’s decision to hire and appoint Engler as the interim president and voice of MSU during this crisis. Engler was probably the only candidate with a high profile and the ability to exercise political influence who agreed not to point the finger at the MSU Board or to hold the trustees accountable for their gross negligence (or worse). But would agree to defend the board and stand behind them in support instead. Those qualities are the exact reasons why Engler should never have been given the job. I don't understand how the Board arrived at the conclusion that John Engler - of all people - could somehow serve as a healing balm on this festering sore. Lou Anna Simon, granted, should have been paying more attention. But she was a saint compared with the political bruiser and politically bruised Enger. What was the Board thinking? Please, MSU Board members, if you can't see the damage you've done, resign and make way for some clearer thinkers. Our precious university deserves better. It is interesting how polarizing John Engler has become to the settlement of this situation... just the opposite of what I suspect the MSU Board of Trustees had hoped. Yet, it is obvious the trustees have no stomach for removing Engler; some support, others chose to ignore. I fear the Trustees will stand on the sidelines and watch as the university gets one black eye follow by another and another and another. With two heading for college in the near future it is really difficult for me to consider MSU as a possibility. I've meet Engler a few years ago and was unimpressed. He was all about himself. MSU completely failed to protect these athletes and is making it worse. Engler needs to go and they need to get a person in charge who can address and fix this culture. I thank the author for her courage and for sharing this with the community. Engler... it's like Trump bringing Cheney back into our government (except he's too ill from years of trying to kill himself from overeating, etc.). 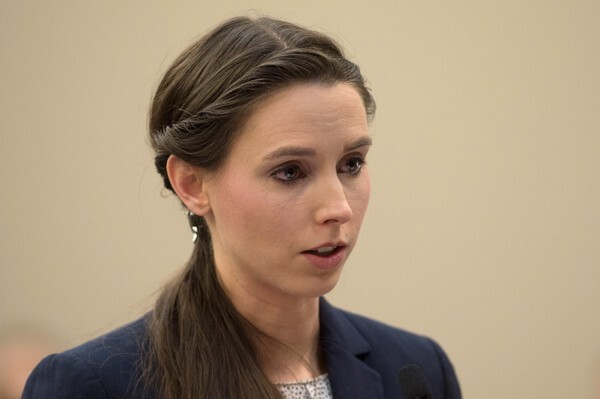 I admire Rachael Denhollender so much for how she prepared to be taken seriously when she was the first victim of Nassar's to successfully bring charges. She is still intelligently trying get MSU to act appropriately but instead it revictimizes . She is appropriately named one the most important persons of the year. Engler. What a great choice. Ya Right. He was the man to make the State of Mi. the Tech. State then he gave a no bid $500 million contract to Texas . He then left office and went to work for that company. That is how I remember it. Correct me if I am wrong. R.L.